UPDATE: As of June 7, two additional battle pets were added to the Beta — Sir Snips (A) and Bucketshell (H). Both are the reward for earning the Honor 400 achievement. An accompanying achievement was also included for collecting all Island Expedition pets, I'm Here for the Pets. Although these pets can be caged, the achievement objectives appear to be the items that teach the pets, so it's possible players will need to actually loot these to complete the achievement. With the additions noted above, this brings the current battle pet total in BFA to 120 new pets. *Whew* that's a lot of pets! Check out 120 Battle For Azeroth battle pets! 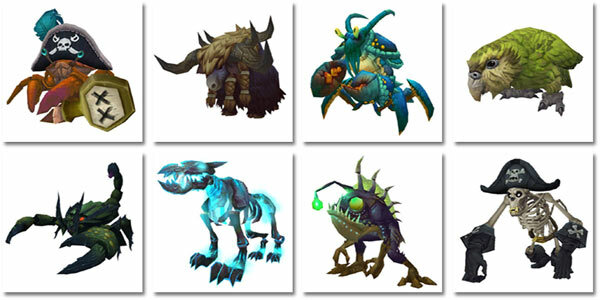 We're absolutely blown away with how many battle pets are coming in the expansion! In comparison, Legion launched with roughly 94 new pets. Which pet has piqued your interest the most? Do you have a game plan for collecting in BFA? We can't wait to collect them all! 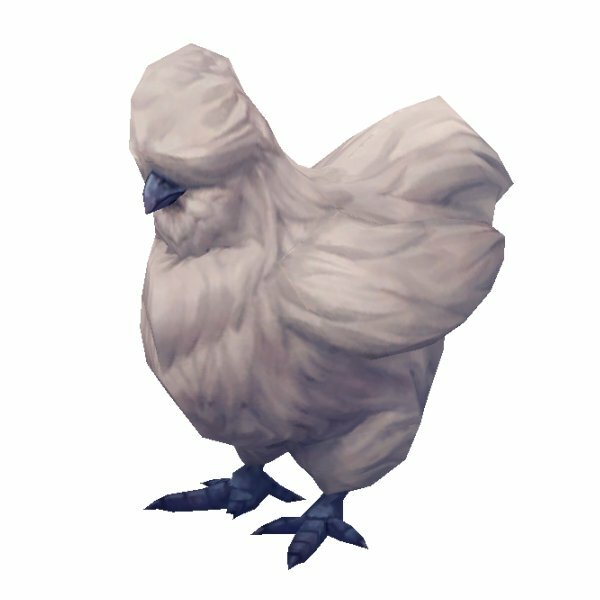 Francois (pictured right) is a silky chicken that can be found at the 15th Annual Norwington Equestrian and Hunt Festival in Tiragarde Sound, Kul Tiras. Players can attempt to speak with him, however it would seem that he has expensive tastes and will not be bothered unless the player has 1 million gold on their person. Upon seeing that the player has sufficient funds to maintain his lavish lifestyle, Francois can then be added to the Pet Journal. Note: Players do not actually have to spend 1 million gold to collect this pet. Having this amount or more in their possession is enough to see the hidden dialogue option. The linked list of pets has 27 wild ones (or at least that’s how many I counted). That means having at least 27 upgrade stones will be useful. I like the "gold digger chicken". I think it's a cool mechanic to get a pet. Also ofc good for gold makers. I REALLY like that you don't actually have to spend the money, just have it on your person :). I find myself discouraged by that ratio of sources of new pets - so relatively few wild options. The devs seem to be using new pets more as a way to force people to support activities Blizzard wants supported than as an organic growth of the pet game. Two more pets in build 788, alliance and horde themed crabs for reaching honor level 400! @FuxieDK, Legion gold rewards are crazy. I've made over 5m gold this expansion. You need to figure out how to make gold it seems. At least the pet doesn't cost 1m, you just have to have it in your bags, its not actually spent. But 5 order halls with gold missions pulling in ~3-8k a day, gold adds up really fast. Also if you have a follower with gold items as your combat ally, you can make 100 or so gold every WQ, 10 WQs, that's an easy 1k. Even if I managed to get all 120 new pets, I'd still be short of Hearthy by ~60. Out of that 60: 15 are Store; 7 Class specific; and 6 "I don't think I can get those". The others are rare/world drops and vendor (specifically Alliance Argent Tournament pets). Oh well, a lot of cool pets to get; and at least I don't have to spend my mil on Francois. I don't have that amount of cash, on all my toons combined; they better up the gold rewards GREATLY from Legion..
@Syyina the limit has been lifted to 10 million gold at the start of Legion. Happy to have so many new pets, but a little disappointed so many are vendor pets. Its just not interesting to buy a pet. I hope the drop rates for the expedition pets aren't super low. I'm glad this number went up significantly from the 70+ originally found. I had resigned myself to hopefully hitting 1,000 unique after a few content patches since there's no way i'll break 915 unique in earlier content. Assuming most of these are fairly obtainable, it looks like 1,000 is possible! Ok, collecting Francois sounds hilarious! Looking forward to that, and all the others of course. Really big and strong pockets to be carrying a million gold. Sooo...show the silkie chick the money, then go buy pets and mounts?